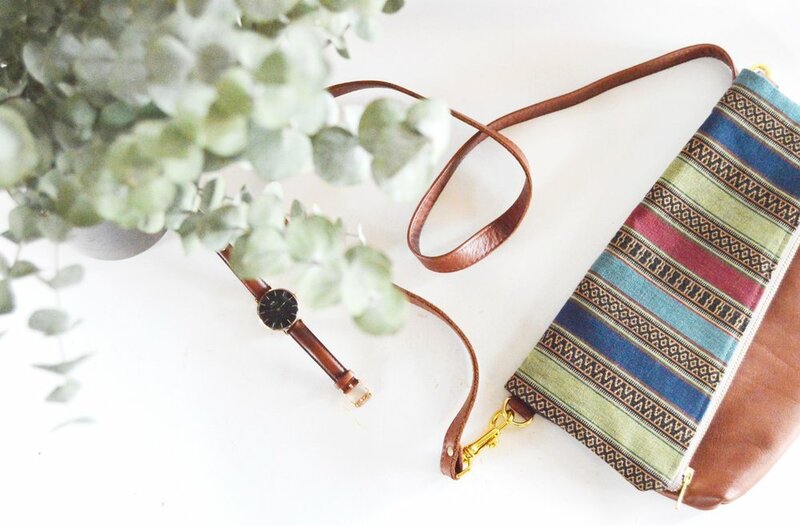 D. Franca Designs || Handmade Bags On A Mission to Empower — Simply Liv & Co. In last months handbag round up, you may remember a quick introduction to a brand I’ve been familiarizing myself with over the past few months. D. Franca Designs, a brand birthed in Italy with roots all over the world, created the gorgeous cross-body bag I’m so excited to showcase today. In early September, I drove to a little town in between Winter Park and Denver to meet Diana, the founder, designer, CEO, and one-woman show behind the brand. We chatted over coffee in a tiny local cafe in Idaho Springs about her background, why she started sewing, what led her to Italy, and more. At the end of our visit, she gifted me with this sweet bag, packaged inside a reusable canvas tote. The bag, that I’ve loved using ever since that day, was completely handmade by Diana. She stitched each zipper and seam, each pattern/leather/metal closure handpicked with care. As are all of D. Franca Design’s bags. That kind of attention to detail and thoughtful curation to hand-make a full line of products is something I can’t relate to and, in the same vein, don’t take lightly. Diana could have just as easily chosen cheaply made fabric from an untraceable supplier, or outsourced her sewing to someone working for low wages, but she didn’t. Instead, she spent time sourcing the perfect fabric and leather, landing on a handwoven striped fabric woven by artisans in India, and of course, sewing the bags by hand in her home studio in Italy. In addition to designing thoughtful bags with a beautiful story, Diana has plans to extend the impact of her business, through hiring her first employee. She recently met a young refugee, relocated to Italy, and looking for work through the Sew Cooperative in Rome, and has plans to teach him how to sew her bag designs, building on his sewing skills. She admitted to me during our chat that sharing her designs with someone for the first time was daunting and hard work, but eventually, she hopes to be able to hire a team and expand her business even further. Businesses like D. Franca Designs are the small startups that make me excited to support slow fashion. Every step of the way, from design, to sourcing, to sewing the bags themselves is a slow, thoughtful, beautiful process that gives me hope for the future of fashion. You can shop D. Franca’s first collection, Mesoamerican Stripes, on their website, or on Overstock!